Meridian PO Finance offers a variety of purchase order financing, or PO financing, options to a wide selection of industries, small businesses and vendors who supply goods and finished products. Typically this form of financing is tied to a specific transaction where our client requires financing to be able to acquire the raw materials and supplies needed to manufacture, re-package, assemble, or purchase finished products. Purchase order financing allows our clients to increase their cash flow by providing them the tools necessary to guarantee growth and maintain profitability. Step One: After your application for PO funding has been approved, Meridian will pay the supplier on your behalf. Meridian can provide up to 100% financing for your business. Step Two: Your supplier will now deliver the goods after they receive payment from Meridian for the goods that you ordered via the purchase order. Step Three: Your customer accepts the goods delivered and pays Meridian PO directly. 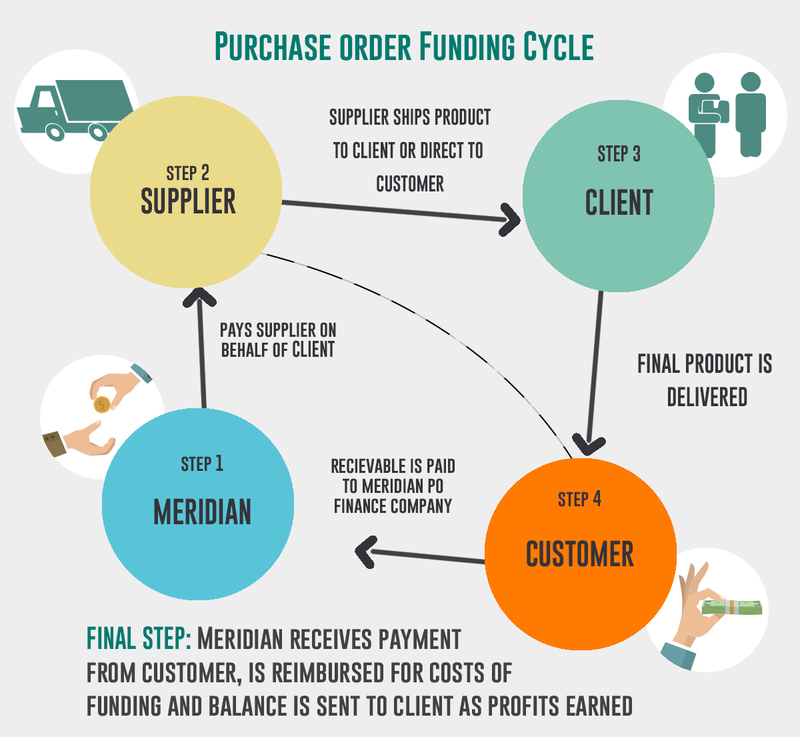 Final Step: Meridian PO finance receives payment from the customer and deducts the costs of facilitating the transaction, before forwarding the rest of the money to your business, your profits. PO financing ranging from $10,000 to $10,000,000. Up to 100% financing for all your purchase orders. Can finance multiple purchase orders. Overseas purchase order financing available via Letter of Credit financing. Purchase Order financing is a form of funding that allows businesses to get quick financing against their purchase orders they’ve received from their customers. Meridian agrees to pay the supplier on behalf of our client for goods, supplies or materials necessary to fulfill their customers contracting request. There are many reasons why businesses use purchase order financing. The main reason is speed. Once approved at Meridian, we can quickly underwriter and finance your purchase orders ad we understand that time if of the essences. Struggling or emerging businesses that have not established a good credit rating can also benefit from purchase order financing as Meridians approval process is based on strength of transactions presented. Another great resource is to utilize purchase order financing coupled with accounts receivable financing to bridge the financial gap with affordable rates. This type of funding is particularly useful for newer businesses. Most businesses – including those that are thriving – tend to fail within the first few years due to cash flow problems. Newer businesses usually have not established a good credit score and getting funding to run their various processes can be very challenging. Through PO financing solutions offered by Meridian, startups can secure funding without having to worry about their credit situation. As long as the business can provide historical evidence that they have completed a similar transaction, with similar products, they will have a greater chance of getting approved at Meridian. Newer business do not qualify for traditional bank loans. Banks need to review assets and financial records before they can determine if you qualify for a loan. Lending institutions take a considerable period of time before they can assess your situation and approve your application. With PO financing, from Meridian, you can get funding against your purchase orders, in a very short period of time. What is PO Finance to a manufacturer? Manufacturers are increasingly using PO financing to fund their supply chain operations. These businesses cannot afford to interrupt their operations due to issues with cash flow. Meridian provides financing for businesses including for orders originating from overseas clients. There are, however, a few rules regarding manufacturing financing. Learn more about our manufacturer financing requirements here.